IS YOUR BAGGAGE GETTING IN THE WAY OF YOU LIVING IN YOUR JETSTREAM? Wow! What an exciting day yesterday was speaking at Clemson University for the “Clemson Ideas” series. My talk centered around two main points: 1) Letting go of your baggage by deciding how to use it and not abuse it. 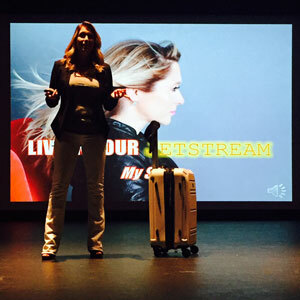 2) How my baggage lead to me “living in my Jetstream.” I defined JETSTREAM as a fast, constant, influential current or person who knows exactly where they are going in life. The not-so- secret secret is that when we get laser focused on our life’s purpose the universe actually pitches in and gives us a boost to help streamline our process. I know this because it has happened to me. The tragedy of losing my father at the age of thirteen left a lasting impression on me. I realized at a young age that helping fatherless daughters was something I definitely wanted to do with my life in some sort of capacity…just not full-time. Little did I know the universe had much bigger plans for me. In my career, I tried to go after anything and everything else in order to “make it big!” I started a greeting card company and sold it three years later. I rose to the top of a Fortune 500 company. I wrote a single’s column, and I started a few other companies along the way but they never really got me excited at a heart level. Why? Because none of those things were my purpose, and helping fatherless daughters was. Even though I was largely successful on paper, inside I was unfulfilled. The road to finding my own JETSTREAM was a long and windy one. There were all sorts of turns, detours and forks in the road trying to slow me down. Some of those roadblocks came from my own baggage while others were meant to teach me divine lessons. Did I really want to expose myself? I often wondered. 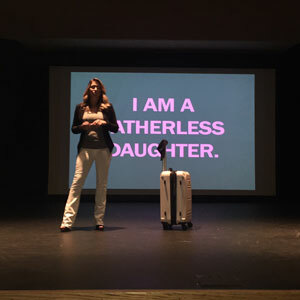 For me, focusing on fatherless daughters meant actually having to sift through my own baggage of being fatherless. When I finally decided to dig deep and “use” what had happened to me everything started to fall into place. Don’t get me wrong. It took work doing the hard heart work. It was a process, but oh my God, what an amazing life altering process it was. Letting go of the baggage that could no longer serve me allowed room for the things that I could actually use to surface. I felt lighter, energized and focused on my life’s JETSTREAM. Everyday I see wonderful people abusing their gifts, or their baggage by choosing to stuff it away or by letting it rule their lives negatively. My purpose as a Life Coach is to help people identify what is holding them back from living in their life’s purpose. If there is baggage, together we figure out what is usable and was to discard. Life has divine order. Everything happens for a reason. Everything. Life is always preparing us for our higher calling. When we take the time to unload our baggage and see what it can actually do for us, a beautiful thing happens. It is called clarity. When we become clear our purpose is allowed to finally take center stage. Life becomes fun, and we take off in the right direction with gusto! It is serendipity really. My dad went to Clemson, as did three generations of my family. My nephew Blake also attends Clemson. He introduced me onto the stage at Clemson yesterday. What a full circle moment. It is no coincidence that Clemson was the first place I would present my talk about how “The Fatherless Daughter Project” came to be. Thank you universe. You knew it all along. Go Tigers! https://dennababul.com/wp-content/uploads/logo-2.png 0 0 julie https://dennababul.com/wp-content/uploads/logo-2.png julie2015-04-02 18:10:302015-05-21 16:23:45IS YOUR BAGGAGE GETTING IN THE WAY OF YOU LIVING IN YOUR JETSTREAM? Just Wow! I have read your entire Fatherless Daughter website and am truly moved. That site lead me here to this blog and I must say first of all, I am proud of you. This is such an inspirational project and I am extremely intrigued. As the mother of a fatherless daughter by divorce/abandonment, this is truly inspirational. I am going to continue to share your path and the stories of others with my daughter as well as use these things in my daily life. Way to go Denna! Thank you! We have a lot more to come so stay tuned. We will do a book signing in Columbia when it comes out. 25 COMPLETELY RANDOM THINGS ABOUT ME ARE YOU BRAVE ENOUGH TO LIVE THE LIFE YOU WANT?